Everyone loves those sugar coated, glazed hams you stand in line for around the holidays. These hams are actually very easy to prepare on your own with a good grill. The secret is to get the sugar to melt and caramelize to the surface of the ham. The advantage you have is that you can heat the ham and coat it at the same time so it is fresh off the grill when you serve it. The best method is to use a rotisserie to cook your ham because you can expose the entire surface of the ham to the heat you need to create that crust. To start out, you want a good ham that isn't going to give you a lot of trouble on the rotisserie. 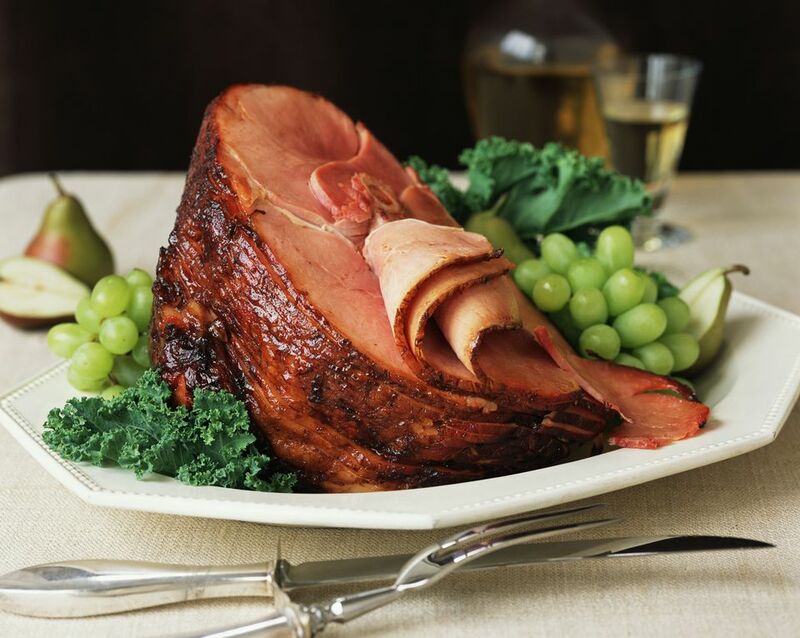 This means that the ham needs to be well proportioned so that it is easy to get balances. If you choose a bone-in ham you might have a little more challenge but if you are careful and take your time getting the balance right you shouldn't have too much trouble. With the ham properly loaded on the rotisserie, you want to start it cooking on the grill. Remember that a ham is fully cooked or cured and doesn't need to be cooked to be eaten. What you are doing is simply heating it to get it to a good temperature for your meal. Like warming a ham in the oven you want to heat it over a low to medium flame. The ham needs to get warm in the middle without having the surface get too dry or cooked. Plan on about 13 minutes per pound, just like you would in the oven. Once the ham has reached an internal temperature of about 150 F (65 C) then you are ready to start applying the sugar to create the crust. Make sure you check the temperature in at least two places. You don’t want there to be a cold area and you want to keep the thermometer away from the bone since bone heats faster than meat. Before you begin applying the sugar on the ham, give the surface something that will hold the sugar on the ham. This should be done with a baste that you brush over the surface of the ham. You can use pretty much anything you want as long as it doesn't have salt. Ham is cured in salt so you don’t want to add any salt to it. A good baste would be water or fruit juice with some spices like cinnamon, ground cloves or allspice. You can also use honey in your baste. With the surface wet you can start sprinkling on the sugar. The sugar you use on your ham is actually important. Regular sugar is very fine and doesn't create the best surface. Use a coarse sugar like raw sugar or turbinado sugar. These are the best. If you leave the rotisserie running while you do the basting and sprinkling you can get to the whole ham quickly and easily. Now it is time to caramelize the sugar. Remember that sugar burns at 265 F (130 C) so you need to watch the ham and the sugar very closely. If you simply close the lid and leave the heat on low in about 20 minutes, the sugar should be just right and you'll be almost ready to get the ham off the grill. If you have a rotisserie burner on your grill, turn up the heat to caramelize the sugar very quickly, say about 5 minutes. Either way, you need to keep a close eye on the process. Once sugar starts to burn you are in trouble. You can't "un-burn" sugar and the flavor is not good. You will end up cutting the surface off the ham. Provided that everything has gone right and the sugar is melted and caramelized, giving your ham a great crusty surface you need to turn off the heat and let the whole thing cool down enough for the sugar to harden. Leave the rotisserie going and open the lid. Give the ham about 10 minutes or until the surface has cooled and the sugar has hardened before you try to remove it from the grill. Once off, carve and serve. If you want, take a look at Grilling Ham - Step by Step.